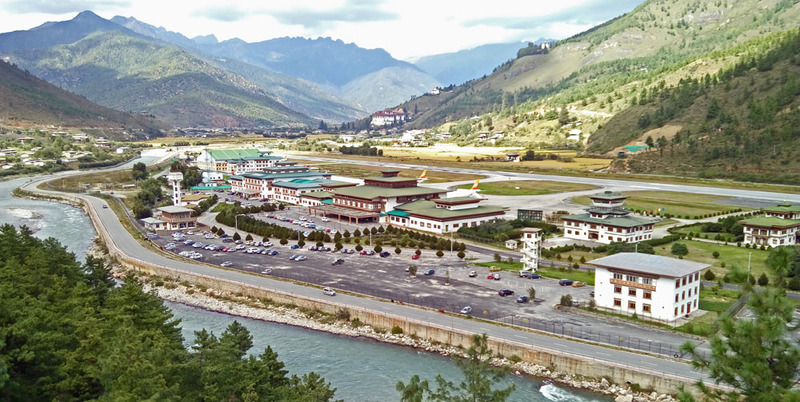 Paro airport is Bhutan's only international airport in a valley on the banks of the river called Paro Chhu. It is a doorway into Bhutan for international travelers. It is known to be most difficult commercial airport in the whole world. There is only one runway, visible at the far end of the picture, in the background below the hills. When planes approach they have to maneuver between very high Himalayan mountain peaks, as high as 18.000 ft. The runway itself is only 1,980m in length and thus makes it even more difficult for the pilots. Very few pilots can make this difficult approach. From the wiki: Flights to and from Paro are allowed under visual meteorological conditions only and are restricted to daylight hours from sunrise to sunset. Related Pictures: Koh Samui Outdoor Airport or Bangkok Airport - Pictures.